The western I-64/I-295 interchange, near Short Pump in western Henrico County, Virginia, has a $49.1 million construction project underway to provide a 2-lane semi-directional flyover ramp for the movement from eastbound I-64 to eastbound I-295 (the current movement is a one-lane loop which will be removed), and to relocate and widen to 2 lanes the ramp for the movement from westbound I-295 to westbound I-64. I-64 to the east and west of I-295 will be widened, and a section of VA-271 Pouncey Tract Road will be widened. The prime construction contractor is English Construction Co., Inc., of Lynchburg, Virginia. The owner and administrator of the respective highways, and this project, is the Virginia Department of Transportation (VDOT). Above, eastbound on I-64, approaching I-295 overpasses, the exit ahead is to the loop ramp to eastbound I-295. Photo taken in March 2006 by Roads to the Future. The Commonwealth Transportation Board (CTB) approved one contract today worth $49 million for Central Virginia maintenance and construction projects. 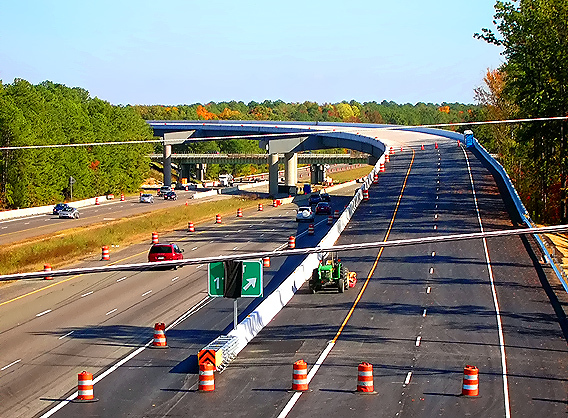 English Construction Company, Inc of Lynchburg, Virginia was awarded a $49 million contract to improve the I-295/I-64 interchange in western Henrico County, widen Pouncey Tract Road and construct a new flyover ramp from I-64 east to I-295 north. 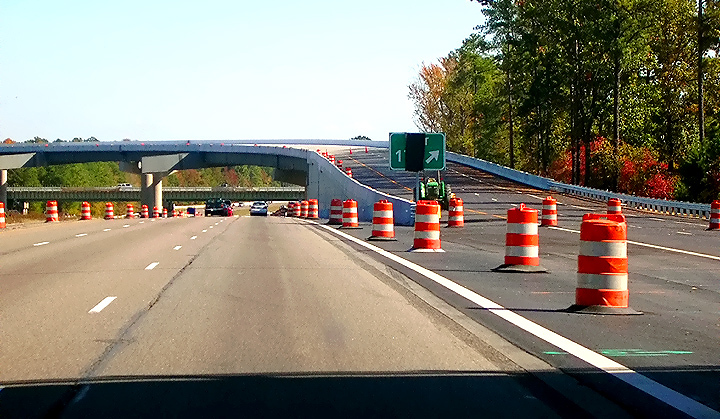 The flyover bridge and additional lanes will improve the flow of traffic between I-295 and Route 288. It will also improve the traffic along Pouncey Tract Road between Broad Street and Twin Hickory Lake Drive. Construction will begin in May 2006 and the anticipated completion date is spring 2009. The lowest bid is close to the VDOT Six Year Program budgeted figure for Construction, which is the contract award amount plus 10% for contingencies (budgeted additions and increases during the life of the contract), plus 5% for construction engineering and project management. The contract has a deadline completion date of May 22, 2009. A 2-lane semi-directional flyover ramp will be built for the movement from I-64 eastbound to I-295 eastbound, and the bridge will be 1,765 feet long and will pass 35 feet above I-64; and the existing loop ramp for that movement will be removed. The existing one-lane ramp for the movement from I-295 westbound to I-64 westbound, will be rebuilt to a higher-speed 2-lane ramp. These ramps will be adequately drivable at 60 mph (the design speeds are a bit higher than that). I-64 will be widened one lane each way to the west of I-295 for 2.0 miles, seamlessly tying into the 0.7-mile-long 3-lane-each-way section of I-64 just east of VA-288, and the result will be 3 lanes each way on the 2.7 miles of I-64 between VA-288 and I-295, with high-capacity freeway-standard interchange movements connecting the freeways on the Richmond beltway route between VA-288, I-64 and I-295. Auxiliary lanes (one each way) will be added on I-64 between I-295 and US-250 at Short Pump, and the result will be 4 lanes each way on the 0.8 miles of I-64 between I-295 and US-250. The 9 miles of I-64 between US-250 at Short Pump and I-95 in Richmond, is currently 6 lanes (3 each way). The 2-lane VA-271 Pouncey Tract Road overpass of I-64 will be replaced with a longer 4-lane overpass to cross I-64 and the extended ramps to/from I-295, and over 1/2 mile of the 2-lane VA-271 will be rebuilt to 4-lanes divided. Pouncey Tract Road does not and will not have an interchange with I-64, but this is a valuable traffic improvement for local traffic in the Short Pump area, as in conjunction with a pre-existing section of 4-lane roadway, it will provide a continuous VA-271 4-lane divided thoroughfare between US-250 Broad Street Road and 1/4 mile north of I-64, tapering to 2 lanes north of there. The loop ramp movement from I-295 westbound to I-64 eastbound will be substantially improved by this project, as the removal of the second loop will eliminate the weaving contention between the two loops, and the entry point from the remaining loop will have an auxiliary lane constructed so that it will extend for a mile to the US-250 interchange at Short Pump. The distance between the interchanges on I-64 in this area are, respectively, 1.2 miles between VA-623 and VA-288, 2.7 miles between VA-288 and I-295, and 0.8 miles between I-295 and US-250. Project Length -- 5.209 Km. Project Type -- Grade, Drain, Asp.  Conc. Pave., Sound Barrier Wall, Ret. Wall, Signals, Util., Br. (2) & Incid. Construction Company - English Construction Company, Inc.
On January 12, 2009, the third lane on I-64 eastbound (toward Richmond) opened to traffic, from VA-288 to I-295, along with the 2-lane semi-directional flyover ramp for the movement from eastbound I-64 to eastbound I-295 (toward Washington and Norfolk). One lane of the ramp opened to traffic initially, and one lane remains closed as of the February 13th update of this website article, as work is still underway on a pier of the bridge. 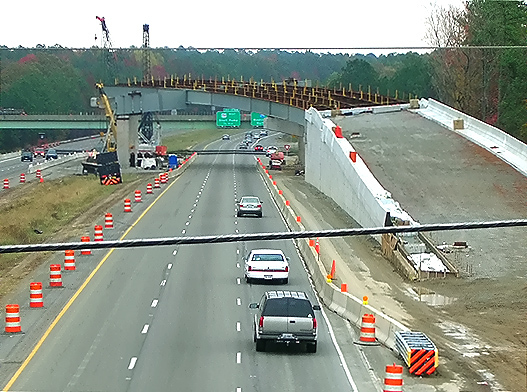 Drivers along I-64 east in western Henrico County will soon enjoy faster and safer access to I-295 thanks to a new, two-lane flyover ramp and extra travel lane between Route 288 and I-295. The Virginia Department of Transportation (VDOT) expects to open one lane of the new flyover bridge to traffic by 8 p.m. The third travel lane along I-64 east will also open. These website articles for this project, track the construction with approximately monthly photo updates. I-64 eastbound and westbound roadways to the left, looking over the approach roadway of the 2-lane ramp that includes flyover bridge from eastbound I-64 to eastbound I-295 (toward Washington and Norfolk). Vantage point is from the VA-271 Pouncey Tract Road overpass. Wide-angle photo. The third lane on I-64 eastbound is about to open, from VA-288 to I-295, along with the 2-lane semi-directional flyover ramp for the movement from eastbound I-64 to eastbound I-295 (toward Washington and Norfolk). The bridge is 1,765 feet long and 35 feet above I-64. It appears that all paving, guardrail, line painting, and signing has been completed for this new high-speed (design speed 62 mph) freeway-standard movement. Photo taken on October 26, 2008 by Roads to the Future. Click photo for large image. I-64 eastbound and westbound roadways to the left, looking over the approach roadway of the 2-lane ramp that includes flyover bridge from eastbound I-64 to eastbound I-295 (toward Washington and Norfolk). Vantage point is from the VA-271 Pouncey Tract Road overpass. Telephoto photo from the same vantage point as the previous photo. I-64 eastbound, passing the entrance to the flyover ramp. The flyover bridge is the higher bridge, and the original I-295 bridges are at the lower bridge level. VDOT considered repaving the pre-existing I-64 mainline lanes in the project area (they need it) as part of this project, with a change order to the contract, but the contractor wanted about 60% more cost per ton of asphalt paving than what VDOT can perform in its maintenance repaving schedules, so VDOT will have the work performed in mid-2009 in a separate maintenance contract. I-64 westbound, approaching the bridges to and from I-295. The flyover bridge is the higher bridge, and the original I-295 bridges are at the lower bridge level. Steel beam placement has begun for the 2-lane flyover bridge from eastbound I-64 to eastbound I-295 (toward Washington and Norfolk). The I-64 eastbound roadway is visible to the left, and the completed construction of the piers for the flyover bridge, and the completed construction of the Mechanically Stabilized Earth (MSE) retaining walls on the earthen fill approach to the flyover bridge. Vantage point is from the I-295 overpass over I-64. In the distance is the VA-271 Pouncey Tract Road overpass, and the construction of the new Pouncey Tract Road overpass. 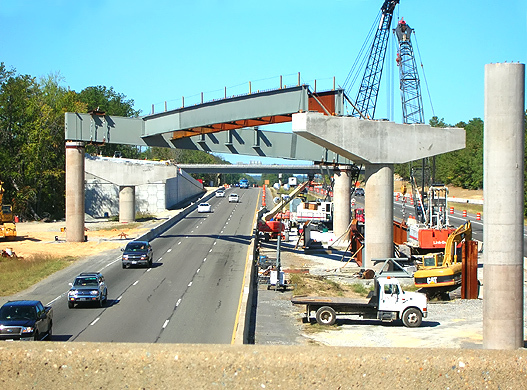 Photo taken on September 29, 2007 by Roads to the Future. Click photo for large image. Steel beam placement has begun for the 2-lane flyover bridge from eastbound I-64 to eastbound I-295 (toward Washington and Norfolk). Similar vantage point as previous photo. 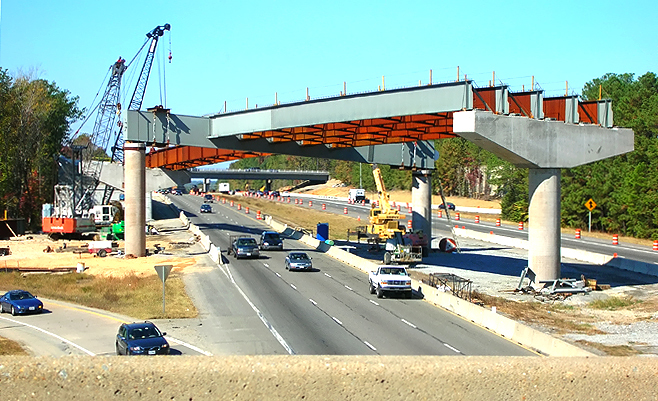 Photo taken on October 20, 2007 by Roads to the Future. Click photo for large image. I-64 looking eastward, from the VA-271 Pouncey Tract Road overpass. Two new lanes are being constructed on the right, for the elevated approach roadway to the eastbound flyover ramp from I-64 to I-295 (toward Washington and Norfolk). Notice the Mechanically Stabilized Earth (MSE) retaining walls constructed on the earthen fill approach to the flyover bridge. Notice the flyover bridge piers that have been constructed, and the steel girders that have been placed on several of the spans, and the I-295 overpasses in the distance. Photo taken on November 10, 2007 by Roads to the Future. Click photo for large image. The 43-mile-long section of I-64 from US-522 at Gum Spring in Goochland County (excepting the I-95 overlap section which opened in 1958), through Henrico County and the City of Richmond, to VA-249 at Bottoms Bridge in New Kent County, opened to traffic in 5 sections from 1966 to 1968. These sections of I-64 were initially built with 6 lanes: The 3.2-mile-long overlap with I-95, 3 miles from Glenside Drive to I-95/I-195, and 7 miles from I-95 to VA-156 Airport Drive. The rest of this I-64 section was initially built with 4 lanes. This section of I-64 contains both interchanges with I-295, which were built later. A major widening project on I-64 for 7 miles between Glenside Drive and 1/2 mile west of I-295, added one lane each way in the median of the pre-existing 4-lane highway to make it 6 lanes (3 each way), and the US-250 interchange at Short Pump was upgraded by the addition of two loop ramps on the south side of the interchange, and built a high-capacity 2-lane left-turning movement for traffic between westbound US-250 and eastbound I-64 (the normal solution of adding a loop ramp for this movement was impractical due to the S&K Menswear corporate headquarters and distribution center that would have to be razed to make space for such a ramp upgrade). This project was completed in 1990. 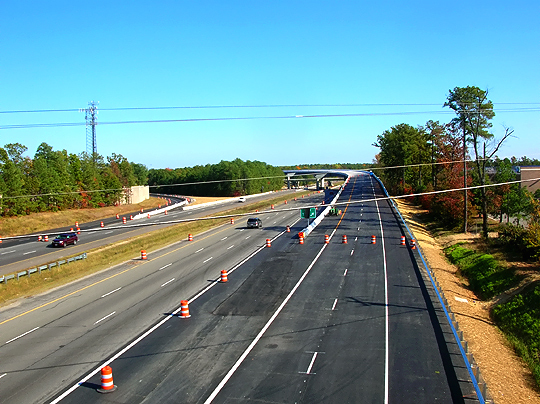 The 15.3-mile-long I-295 northeast quadrant in Henrico County from I-95 to I-64 and US-60 at Seven Pines was opened in 3 sections from July 2 to October 30, 1980. The 9.6-mile-long I-295 northwest quadrant in Henrico County from I-95 to I-64 at Short Pump opened on February 2, 1981, and that was when the current I-64/I-295 Short Pump interchange was completed. I-295 has 6 lanes on the northwest quadrant (I-95 north to I-64 at Short Pump), 8 lanes on the northeast quadrant (I-95 north to I-64 at Sandston), 6 lanes from I-64 to VA-36 at Hopewell, and 4 lanes from VA-36 to I-95 south of Petersburg. This is the original configuration and there have been no major widening projects as of 2006. The western portion of Route VA-288 originally was proposed extending from today's I-64/I-295 junction near Short Pump in western Henrico County, through Midlothian in Chesterfield County, to the junction of Route 288 and Route VA-76 in Chesterfield County, west of the City of Richmond. I-295 and Route 288 would have formed a seamless Richmond Beltway, with that freeway junctioning I-64 near Short Pump with a full cloverleaf interchange (4 loops and 4 outer ramps). The northerly half of the movements of that interchange was built and opened to traffic in 1981, along with the entire I-295 mainline pair of 3-lane roadways extending through the interchange and temporarily ending about 100 yards south of I-64; with the ultimate plan to complete the southerly half of the movements of that interchange when Route 288 was extended to the south of I-64. Route 288 would have had a half-cloverleaf interchange with US-250 Broad Street Road at Short Pump, with the ramps to the south of US-250, providing full interchange movements between Route 288 and US-250. After location studies in the late 1960s, this easterly Route 288 route location was approved by the Virginia State Highway Commission in 1969, with a seamless I-295/VA-288 Richmond Beltway configuration at Short Pump. This proposed location for the western portion of Route 288 was abandoned by the Commonwealth Transportation Board (former VSHC) in 1988, due to extensive later development along portions of the route in Chesterfield and Henrico Counties (28 businesses along US-60 in Midlothian would have been razed by the original location); that is when the present western location of VA-288 was approved by the CTB, and this location passes through the eastern corner of Powhatan County and the eastern portion of Goochland County, interchanging I-64 about 1/2-mile west of the Goochland/Henrico County Line. A 4-lane arterial highway location was also approved by the CTB in 1989, the John Rolfe Parkway, as a 3-mile-long highway extension from I-295 southward from I-64 to Gayton Road. About 1.2 mile of the John Rolfe Parkway has been built between Gayton Road and Ridgefield Parkway, but most of the parkway remains unbuilt. The John Rolfe Parkway connection to the I-64/I-295 interchange, has been deleted from the Henrico County master plan, as confirmed by VDOT engineers in a 2005 discussion, so the design of the current I-64/I-295 Interchange Modification Project is configured with the understanding that there will not be a southerly connection/extension to/from this interchange and I-295. The future plan for the I-64/I-295 interchange is for it to remain a 3-leg freeway-to-freeway interchange. The newspaper Richmond Times-Dispatch had a couple articles in 2005 about official discussions by Henrico County about applying to the state for a new local interchange to be built on I-64 about 1.5 mile west of I-295, and this interchange would be with a northern 4-lane extension of Gayton Road. This interchange, in conjunction with the existing I-64/US-250 interchange, would provide enough local access in the Short Pump area to I-64 and I-295, to replace the need for a John Rolfe Parkway connection to the I-64/I-295 interchange. See Roads to the Future article Richmond Beltway (I-295 and VA-288) for a map of that facility as originally envisaged, and more historical details of the two highways. Copyright � 2006-2009 by Scott Kozel. All rights reserved. Reproduction, reuse, or distribution without permission is prohibited.